Click on the button next to each album to be redirected to our albums. Please take a listen to each of these pieces and all feedback/donations are welcome! Thank you much! This album is comprised of our two contest pieces for the 2014 NABBA Championships, which is held in Ft. Wayne, IN. 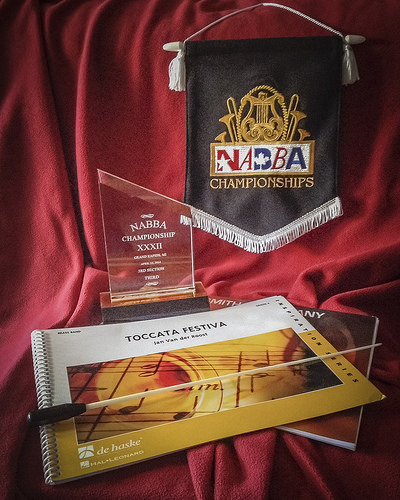 This album is comprised of our two contest pieces for the 2015 NABBA Championships, which is held in Ft. Wayne, IN. We opened for the Greenwood Community Band during this beautiful summer evening in Greenwood, IN. We continued to dazzle with our summer program with familiar tunes that were enjoyable, fun, and energetic; not only for us to perform, but also for our audience to join in. This performance took place in Terre Haute, IN for the 2016 Banks of the Wabash Festival. Many groups came and performed for the good people of Terre Haute and our hope is that this music is enjoyable for you as well. To celebrate the 200th year anniversary of Indiana's birth year, we decided to program a bunch of tunes from Indiana composers and familiar down-home classics! This performance took place at the beautiful Roberts Park in Connersville, IN. This album is full of fun, energetic, and recognizable tunes as we wrapped up our Summer Concert Series. We hope you enjoy this as much as we did performing it.